Tian Hu catches the pervert and realises he is Bai Zhan Ji. She escapes to the multi-story carpark and calls home for help. When Ye Meng arrives, Tian Hu is held hostage. After Bai Zhan Ji forces Ye Meng to strip, he takes a photograph of him to make him the scapegoat. 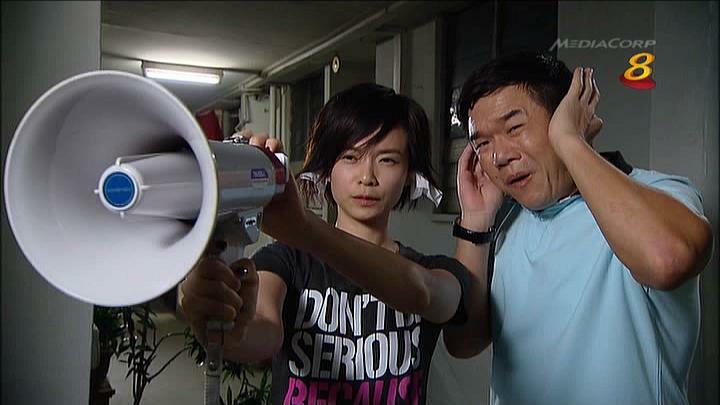 Fortunately Tian Hu helps to clear Ye Meng’s name. De Liang is caught in between his wife and his mother. His principal reminds him to remain focused on work or risk a poor work appraisal. Depressed, he turns to stealing in school, and suspiciously hides things into his locker. Tian Hu discovers with shock that Ru Yi is her biological mother. After her persistent questioning, Da Fa reveals that Ru Yi did not die of labour, but instead lost Tian Hu in a final gamble before going missing. Tian Hu is touched that her father sacrificed himself to protect her from the truth. The two hugged each other in tears. De Liang is censured by his school when a female student uploads a picture of the both of them, and expresses her love for him on her blog. Under pressure, De Liang shoplifts from a supermarket and is witnessed by Shan Shan. The store manager discovers the theft and threatens to call the police. Shan Shan then pretends to be his wife, and kneels down to plead with the manager. De Liang’s principal finds about his kleptomania, and threatens to report it to the ministry. De Liang pleads for forgiveness, but is asked to resign. He tells Angelina that he would like a sabbatical, but she furiously objects. De Liang is forced to hide his resignation from her. Shan Shan encourages him to seek treatment, and kickstart his life again.